Ethyl acetate extracts from heartwood of seven western conifer trees and individual volatile compounds in the extracts were tested for antimicrobial activity against Phytophthora ramorum. Extracts from incense and western redcedar exhibited the strongest activity, followed by yellow-cedar, western juniper, and Port-Orford-cedar with moderate activity, and no activity for Douglas-fir and redwood extracts. Chemical composition of the extracts varied both qualitatively and quantitatively among the species with a total of 37 compounds identified by mass spectrometry. 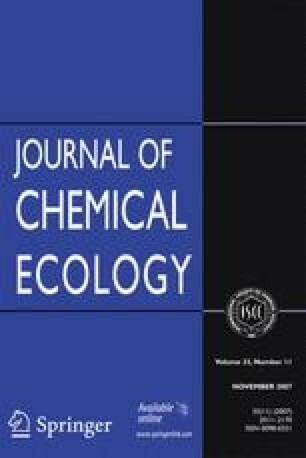 Of the 13 individual heartwood compounds bioassayed, three showed strong activity with a Log10 EC50 less than or equal to 1.0 ppm (hinokitiol, thymoquinone, and nootkatin), three expressed moderate activity ranging from 1.0–2.0 ppm (nootkatol, carvacrol, and valencene-11,12-diol), four compounds had weak activity at 2.0–3.0 ppm [α-terpineol, valencene-13-ol, (+)-β-cedrene, (−)-thujopsene], and three had no activity [(+)-cedrol, δ-cadinene, and methyl carvacrol]. All of the most active compounds contained a free hydroxyl group, except thymoquinone. The importance of a free hydroxyl was demonstrated by the tremendous difference in activity between carvacrol (Log10 EC50 1.81 ± 0.08 ppm) and methyl carvacrol (Log10 EC50 >3.0 ppm). A field trial in California, showed that heartwood chips from redcedar placed on the forest floor for 4 months under Umbellularia californica (California bay laurel) with symptoms of P. ramorum leaf blight significantly limited the accumulation of P. ramorum DNA in the litter layer, compared with heartwood chips from redwood. We thank the US Department of Agriculture, Forest Service, Pacific Southwest Research Station for funding and the Marin County Open Space District for a permit to work on the Rush Creek Preserve. We thank John Bannister, Ketchikan Wood Technology Center for samples of Alaska yellow-cedar, Gene Braber, USDA, Orleans Ranger District for the sample of Port-Orford-cedar, and Greg Jennings, Bureau of Land Management, Arcata, California Field Office for the sample of redwood. We are especially thankful to Dr. Everett Hansen at Oregon State University for providing the P. ramorum isolate and use of his laboratory facilities and to Lyndsay Frady for her assistance conducting the bioassays.